Current statistics suggests that there are well over 65 million homes in the country with family pets. Many of these households think of their pets just like a member of the family. As any pet owner knows, mishaps are simply a part of having pets. • Expediency is the name of the game. A quick reaction could save you additional work. If you act rapidly, your likelihood of having the capability to remove the spot improve by 75%. • As heat sets many blemishes, take caution not to make use of an iron or use hot-air to dry the problem area until you are sure that the stained area is completely gone. • NOTE: Eliminate as much of the stain as you're able to by blotting liquid spots and scraping up solid stains, such as mud. • Fluid spots can be eradicated with a wet/dry vac when you have access to one. • We can't over-emphasize this enough: you must take extra caution not to do anything may possibly spread out the stain. • When using chemicals to remove spots, test an area that is concealed such as a closet prior to trying it on the spot. This should make sure that if you experience any discoloring or damages to your carpet fibers, it's possible to cover up the misstep and try yet another spot-removal option. • Anytime you use the spot removal treatment, move from the outside borders of the spot toward the middle. A word of caution: blot the remaining cleaning solution out of your carpet, see to it that that you never scrub or scour your carpeting using a hard bristled brush. The brush is going to cause damage to the carpet fiber. • When you do use a chemical-based spot remover, be sure to thoroughly rinse the area with clear water. Then make certain to dry the spot as much as possible. When you're getting rid of spots on carpeting or upholstery, press an absorbent layer of bath towels or other absorbent pad and weigh it down with some heavy item. Leave the whole thing in place overnight. This should help to absorb any excess moisture. Even though some stains can be eliminated with the help of these Do It Yourself tips, often times the stain is beyond your ability to remove. We here at OxiGreen assure you that we have years of experience, the correct equipment, as well as the knowledge to eliminate virtually all carpet stains. 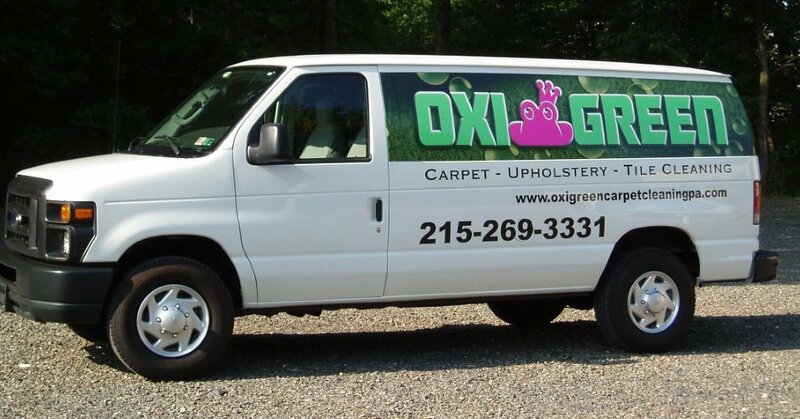 For fast stain removing and expert carpet cleaning, call OxiGreen in Warminster, PA at 215-269-3331 today! We can help you with all your carpet and upholstery stains, carpet stretching, expert carpet repair and more.